This is a real story of a man in picture who is shown as a Hindu aggressor in 2002 Gujarat riots. He is shown as the face of Hindu rioters, a face having lots of anger and ready to attack. An iron rod in his hand, stretched arms and expression of anger make him look very threatening and dangerous for the opponents. This one photo was propagated as the face of Gujarat riots but the question is whether this photo has any relation to the Gujarat riots at all? Whether the man in picture shown as an assaulter was even a rioter? The man in picture named Ashok Parmar is a cobbler mending shoes in a small shop situated at a corner of Shahpur road in Ahmedabad city since last 20 years. He still does not carry a mobile phone and one who wants to meet him has to visit his shop. We personally visited his shop to meet him. 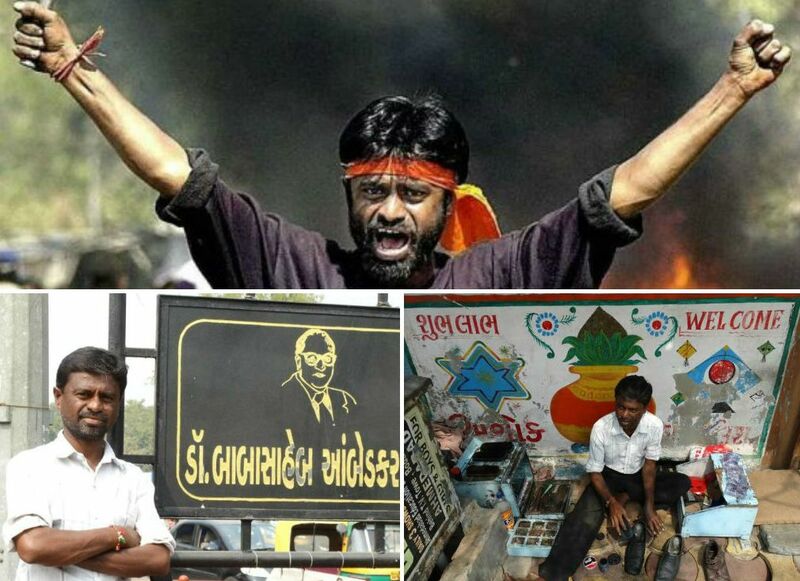 He is the same Ashok cobbler whose photo was widely propagated in context of Gujarat riots. This hasn’t been limited to only a photograph but he has also been invited for various programs so that he can be identified as a person in riots. This year in March Ashok was seen on the stage of a book inauguration program held by CPM. After the program, most of the journalist covering this news addressed Ashok as Hindu rioter from 2002 Gujarat riots. After 12 years also neither the identity nor the image of Ashok has changed. This happened because Ashok’s photo has given the impression to the world of a live example of “Hindu Aggression.” The problem here is though his photo is used by all big and small new papers but nobody has ever tried to take his view of Gujarat riots. As Ashok recollects about this episode, the only fault he thinks he had made was he agreed to pose for a photo to a well-known photo journalist ‘Sebastian Dsouza’. He quotes “Ab apna photo aana aacha lagta hai naa”. With this photo Sebastian Dsouza got many awards but Ashok had to pay the price of making many rounds to the police station in addition to monetary loss of thousands of rupees. Just a small nod to agree for a photograph and he became a symbol of threat & aggression. Ashok had started a small shop of mending shoes in Shahpur road in Ahmedabad city about 20 years back. It was just few days after he lost his parents. His love story didn’t work out and ended up staying unmarried. His brother asked him to leave the house. He could have asked for his share in property but he did not do so. He spent many nights sleeping outside his shop with a mere bedsheet. The way his photo was flashed in the newspapers during Gujarat riots made him look like a big leader of Bajrangdal. In fact Ashok is greatly inspired by Babasaheb Ambedkar. He believes in Babasaheb’s ideology of equality and brotherhood. So It is all the more necessary for us to know if he was actually not involved in the Gujarat riots, how did his photo get flashed in the newspapers. Ashok narrated this story himself. It was the day after the Godra incident. After the incident Hindu Vishwa Parishad had announced Bandh in Gujarat state. Ashok read about the bandh and did not open his shop. He was sitting in the neighboring shop of Nazir Bhai. Around 10- 10.30 am he heard slogans and shouts of people who were aggressively getting the opened shops closed. Since Ashok was sitting in Nazir Bhai’s shop he was also questioned. He tried to convince them that he was a Hindu and has his own shop nearby. His long beard made him look like a Muslim person. When the situation started becoming little tensed, to save himself, he tied a saffron cloth round his head. By 11-11.30 am when mob started coming on the roads he decided to run towards his chawl. That very time Sebastian D’Souza, who at present works for Mumbai Mirror, happened to see him. He, who had taken photo of Ajmal Kasab (prime accused of Mumbai terrorist attack of 26/11), also took this particular photo of Ashok. There is an interesting story behind this photo. Sebastian D’Souza asked Ashok about his opinion on Godhra incident. Ashok told him that what happened in Godhra was not right and what is happening here is not good as well. He further told him whatever Muslims have done in Godhra is not preached by Islam and what Hindus are doing here is nowhere preached in Hindu Dharma either. During that discussion, D’Souza convinced him to pose such that it would represent the anger in the minds of Hindus in context of the Godhra incident. The very same photo of his was eventually propagated across the world as the face of Hindu rioter taking revenge against the Godhra incident. The day after Godhra incident when this photo was taken, neither Ashok nor D’Souza had imagined that riots would take a scale as large as it turned out to be. Ashok says he is a normal person who feels sad whenever there is a death. He further says that today he has been falsely made a villain in the world and his name is registered against the offence which he has never done. His innocence can be proved by asking about him in nearby Muslim localities. The day he gave his photo the situation was not so tensed. He further adds that if at all he had slightest of inkling on what his single photo would turn out to be, he would have never posed for one. Ashok says during the riots he in fact helped many Muslim families and saved their lives. This is the reason that even after his photo negatively published in so many newspaper, there was not much effect in the minds of the Muslims of Shahpur road. People know him very well and didn’t really pay much heed to such news. It is only people who do not know about him hate him. Even months after the riots, there were attacks on him by people wearing masks and he was even hit by bullets. In spite of all of these, Ashok never registered a police complaint. He optimistically feels his attackers will know the truth someday and will regret for their deeds. This case of an innocent Ashok turned into a symbol of Hindu aggression is a serious offense by the photographer. When we reached Sebastian D’Souza for his side of story, he plainly avoided saying it was 12 years back and didn’t see the need to talk about it now. For last 12 years, Ashok has witnessed lot of difficulties for the offence he never even thought of committing. Shouldn’t journalists like Sebastian D’Souza be more responsible while executing their duties? Don’t they need to take the accountability of destroying someone’s life by creating a criminal out of an innocent person? The people of Shahpur road knowing Ashok for years, both Hindus and Muslims, are willing to become his witness in the court of law. But the bigger question is – Ashok has already suffered for last 12 years living a life in fear and stress becoming a symbol of something which he has never been. Who should be held accountable for the loss of his precious 12 years? This entry was posted in Nation, Social Issues, Threats and tagged Godhra, Gujarath riots, Hindu extremism, Hindu Terror, Media and HIndu terror on January 5, 2015 by arisebharat. Qutubuddin Ansari, whose frightened face in a famed news photo of the violence became emblematic of the Gujarat communal violence, and Ashok Mochi, a former Bajrang Dal activist, met each other, shook hands and exchanged pleasantries and flowers on the stage. Both of them, now in their forties, stood there in front of the crowds to trigger memories of the riots. The picture of Mr. Ansari with his folded hands and agonised expression of helplessness is still afresh in the minds of the people who gathered there. Equally strong was the image of Mr. Mochi shouting slogans carrying an iron rod. Both of them were the guests at a public seminar titled ‘12 years after the genocide,’ organised by CPI(M)-sponsored cultural organisations at Taliparamba. The seminar was inaugurated by CPI(M) leader and former Minister T.K. Hamza. At the function, Ansari’s autobiography in Malayalam Njaan Qutubuddin Ansari, prepared by Saheed Rumi, was released by CPI(M) district secretary P. Jayarajan.